ScanTemp 440 infrared thermometer is a non-contact infrared thermometer with a thermocouple connector that you are able to attach an assortment of type K thermocouple probes to measure core temperatures. The adjustable emissivity assures accurate measurements. For maintenance application the Audible and Visual HI-LO-Alarm is a very useful feature. 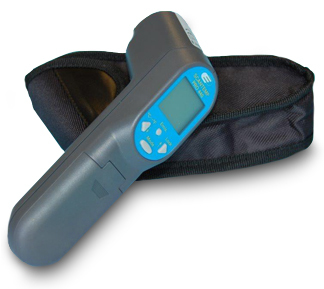 For the infrared part, simply aim the thermometer at the target and press the measurement button to display the surface temperature in less than a second.